Remove from the oven and immediately turn the cake out of the pan onto a wire rack to cool. Mix the sugar into the coffee. Evaporate down (by boiling) the coffee-sugar mixture until only 1/3 cup remains. Add the Marsala wine or brandy and stir. In a bowl, beat the sugar into the Mascarpone cheese until well blended. Add the 2 egg yolks and Marsala, Cognac or brandy and beat more, until the mixture is smooth. In a bowl add the whipping cream, sugar and vanilla essence and stir until ingredients are blended. Beat the mixture with an electric mixer until glossy and stiff. Slice the Genoise cake in half, to make two cakes of half the original height. Place the first slice of the Genoise cake at the bottom of a serving bowl or pan and sprinkle half of the coffee mixture over it. Spread half of the Mascarpone creme on the cake, using a spatula. Spread half of the whipped cream over the Mascarpone cream and sprinkle half of the chocolate gratings over the whipped cream. 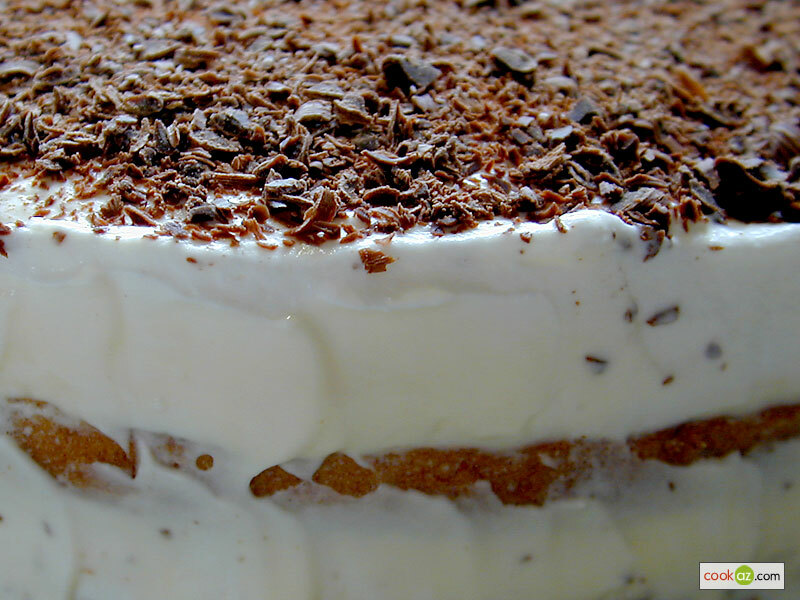 Put the second slice of the Genoise cake on top and repeat the above procedure with the coffee mixture, Mascarpone, whipped cream and chocolate gratings to finish the Tiramisu. Cover with plastic wrap and refrigerate for at least 6 hours. Add the eggs and 1/3 of the sugar into a bowl over a pot of boiling water. Make sure that the bottom of the bowl does not touch the water. Beat with an electric mixer. Beat until the mixture is pale yellow in color. Add the remaining sugar and continue beating. Beat until the mixture increases in volume and becomes thick enough to form ribbons when poured. Slowly fold in the cake flour. Fold in the melted butter and stir until the ingredients are well blended. Butter and lightly flour a 10" pan. Pour the mixture into the pan and bake at 350° F for 30 to 40 minutes. When the cake is ready, remove from the oven and immediately turn it out of the pan onto a wire rack to cool. While the cake is baking, prepare the coffee mixture. To do that, pour the coffee into a pot, add the sugar, bring to a boil, lower heat and cook until the coffee-sugar mixture is reduced to about 1/3 cup. Add the Marsala wine or brandy into the reduced coffee, stir and set aside. Prepare the ingredients for the Mascarpone cream. What we will need is 1/2 pound of Mascarpone cheese, 1/2 cup of superfine (icing) sugar, 2 large egg yolks and 3 Tbsp Marsala wine, Cognac or Brandy. Add the mascarpone cheese and icing sugar into a bowl and start whisking using a wire whisk. Whisk until the mixture is smooth and the sugar is fully incorporated into the cheese. Add the egg yolks, Marsala wine or Cognac or brandy and beat until the mixture is smooth. Continue beating until the mixture is smooth and creamy - You can use an electric mixer. In a bowl add the whipping cream, sugar and vanilla essence. Beat the cream mixture with an electric mixer until glossy and stiff. When the sponge cake has cooled down, cut it in half using a long knife. Place the bottom piece of the sponge cake onto a serving dish and spoon half of the coffee mixture onto it, making sure to cover the entire surface with it. Spread half of the Mascarpone creme on the sponge cake and smooth using a spatula. Spread half of the whipped cream over the Mascarpone cream and smooth. Sprinkle half the chocolate gratings over the whipped cream. Put the second slice of the Genoise cake on top of the first layer. Be careful not to break the cake - you can use the bottom of a pan with detachable sides or a similar flat surface to slide under the cake, lift it up and place it on top of the first layer. Repeat the above procedure by spooning the remaining coffee mixture on the cake, spreading the remaining Mascarpone mixture and then the whipped cream mixture. Spread some of the cream around the cake, sprinkle with the remaining chocolate gratings and refrigerate for at least 6 hours. For best results refrigerate overnight. Step 3 says to sift a half cup of plain flour. Step 8 says to fold in the cake flour. Susan, you can use plain or cake flour for this recipe. The amount of flour used is so small that it does not make much difference. what if I wanted to add lady fingers around the cake? when would I add those without the cookies going soggy? Great recipe fun to make! The cake turned out half the size it was supposed to be and I followed the directions exactly, very disappointing the morning of an important birthday. Same problem as Smk.... my cake turned out half the size and not spongy at all (but I followed everything exactly). Trying again, but not too hopeful. Very disappointing since this is for my anniversary! update to last post: I tried a second time and it still didn't work. After talking to my mom she suggested I change to cake flour (not listed in the ingredients). It still isn't working. This recipe is a flop! 3 attempts... he can't fault me for going to the grocery store and buying a cake, right? Ok my cake worked out for me. Height wise it was fine but it did shrink in diameter. I completed the cake and stuck it in the fridge. After the mascarpone and whipped cream, the cake looked a lot larger. Before serving I placed the ladyfingers around the outside, have to admit cake was pretty good! We tried this recipe and it turned out wonderful. Thank you SO much for posting it! !